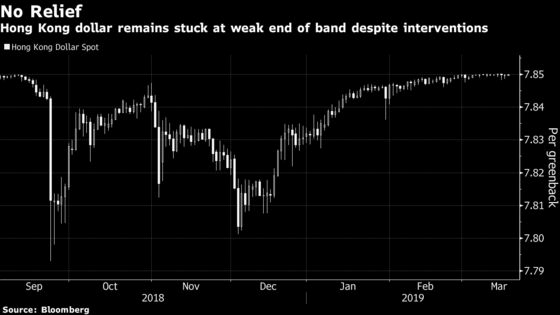 (Bloomberg) -- The cost of Hong Kong’s defense of its currency is mounting as the local dollar remains stuck at the weak end of its trading band. The Hong Kong Monetary Authority bought HK$2.01 billion ($256 million) on Monday, according to its page on Bloomberg. The authority has spent HK$7.4 billion this month purchasing local dollars as low interest rates make the currency less attractive to hold compared with the higher-yielding greenback and yuan. While the interventions help drain interbank liquidity, as measured by the aggregate balance, borrowing costs in the city remain low. One-month rates were at 1.57 percent on Monday, compared with 2.48 percent for those in the U.S. Analysts last week predicted the HKMA would need to spend another HK$50 billion at least before rates rose sharply. The Hong Kong dollar was last at HK$7.8498 per greenback, close to the weak end of HK$7.85.